Your seven-day adventure will enrich your adventurous spirit with beautiful landscapes along the way. As you travel, your eyes will be enchanted by the many different towns and awesome gorges. On your way, you will have a chance to taste the most delicate and mouth-watering wines and delicious foods as well. The North of Argentina is like a treasure chest full of jewels that you will enjoy every day. In this fabulous Northern Argentina tour, you will travel through an amazing spectrum of landscapes, including everything from dense forests to bleak deserts! Take a tour of Salta's charming city centre, with its pastel coloured colonial palaces and cathedrals. Indulge in a Cafayate wine tour, where you'll taste some of the best wine in Northern Argentina. Take a trip to another planet in the Calchaquí Valley. 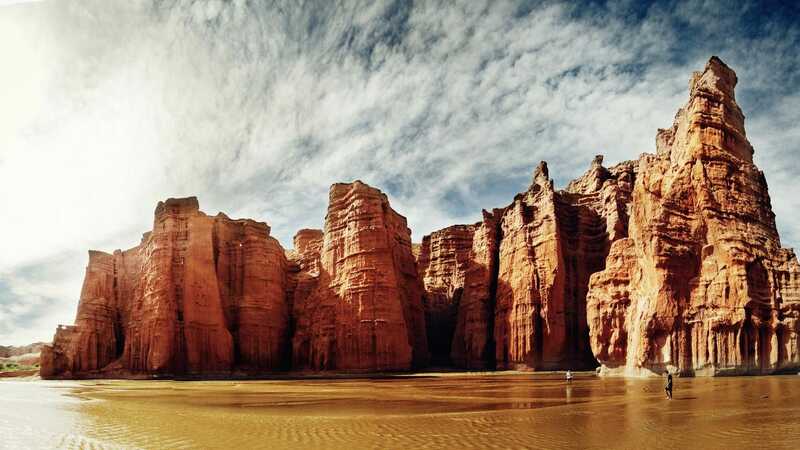 The vivid reds of the cliffs and hills will make you feel like you're walking on Mars! Explore the diverse towns of the Quebrada de Pumamarca. Explore Inca ruins and cliffs striped with all the colours of the rainbow! Click through to “Tour Plan” to see the full itinerary for the Northern Argentina Tour. 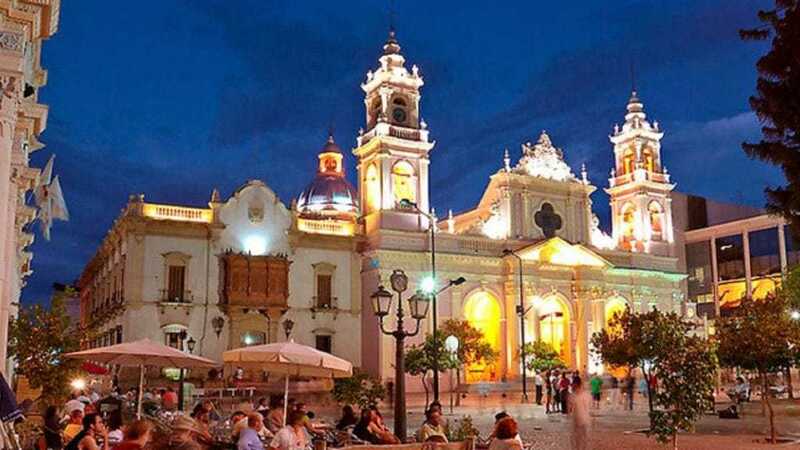 Explore the charming city of Salta, the jewel of the region. With our fascinating walking tour, you will discover the city’s colonial past and modern beauty, and visit such highlights as Basílica Cathedral, Cultural Center of the Americas, and the Historical Museum of the North. Spend the day exploring Calchaquí Valley and the Conchas Gorge, where the vividly coloured cliffs and bizarre rock formations will make you feel like you’re on a different planet! Round the day off with a wine tasting in Cafayate, one of the world’s best wine regions. Visit lost desert towns in vibrant Northern Argentina before wandering the lunar landscapes of the Quebrada de las Flechas. You will spend the night in the small village of Cachi. Head back towards Salta, stopping off at the National Park of the Cardones to admire the hundreds of thousands of cacti, some of which reach three metres in height! You will also visit the unique Quebrada de Esciope, where the rainforest climate is a stark contrast with the rest of the region! Travel along the route of the Train to the Clouds, through the Quebrada del Toro. On this amazing journey, you will see a fabulous spectrum of landscapes, from dense forest to bleak puna desert. End the day at Purmamara, with a visit to the beautiful Hill of Seven Colors. Travel through the Quebrada de Purmamarca, stopping off at diverse desert towns such as Tilcara, Humahuaca, Maimara, and Jujuy. You will see vividly colourful mountains, visit ancient Inca ruins and meet the ancient cultures that live in this remote region. Finish the day in Salta. Return to the Salta airport with a private airport transfer or continue exploring the city on your own. Salta is a charming city, rich in history. It played an important role during the Colonial time due to its proximity to the mines in Potosí, Bolivia. Discover its colonial past along with your private guide on a Salta tour, walking the streets and admiring the most important places such as the Basílica Cathedral, Cultural Center of the Americas, and the Historical Museum of the North (Cabildo) among others. You will also visit the summer village of San Lorenzo on the outskirts of the city with a subtropical microclimate and the handicraft market where handicrafts are displayed that include a guarantee of origin throughout the province . Activities:all the ones described in the itinerary accompanied by a professional tour guide. After a delicious Argentinian breakfast, you will visit the most magnificent towns in the Calchaquí Valley; furthermore, you will be amazed by the colors of the mountains. You will get to know the colorful Conchas Gorge that is famous for its beauty, shapes and terracotta colors. Later on, you will arrive in Cafayate, a small well-known city that produces the best wine in Northern Argentina. Many people around the world have chosen to stay in this splendid city due to its wonderful landscapes, quality of life, and fantastic weather all year round. In the afternoon, you will enjoy a wine tour and tasting to sample the most emblematic wine cellars in the area. Activities: All the ones described in the itinerary (including the wine-tasting) accompanied by a professional tour guide. On this day of your Argentina tour, you will travel to one of the most beautiful places on your adventure. You will get to know some small forgotten towns of Northern Argentina as well as the impressive the Quebrada de las Flechas (Gorge of Arrows). The gorge is formed out of angled tall rocks, and is prominent place for its incredible structures where you will feel as though you are on the moon. Afterwards, you will continue your adventure to the small village of Cachi. Spend a wonderful night staring at the shining stars that the unique Calchaqui Valley can offer. On this day, we will enjoy even more distinctive landscapes in the North of Argentina. Your tour will stop at the National Park of the Cardones where you will admire the charm and greatness of the tall teasels or cacti. You will also see the Quebrada de Escoipe and observe how the scenery changes as you make your descent back to the city of Salta. Today will be one of the best in your tour of Northern Argentina. We will take a route parallel to the Train to the Clouds by the Quebrada del Toro. Then, you will continue your adventure ascending to 4080m.a.s.l. and arrive in San Antonio de los Cobres. After a delightful lunch, you will go through route 40 toward the Salinas Grandes, just between the provinces of Salta and Jujuy. Subsequently, you will descend via the Cuesta de Lipán, to the town of Purmamarca and its fantastic Hill of Seven Colors. If you're lucky, you may be able to find Andean condors along the way! You will leave the city of Purmamarca in order to start your adventure along the Quebrada de Purmamarca, a gorge which was declared a Patrimony of the Humanity by UNESCO. As you admire it, you will see how the scenery and the colors of the hills mix together with the cultures that inhabit this area. It is a social experience, complete with interactions and an ancestral perspective. You will pass the Posta de Hornillos toward the town of Tilcara where you will visit the Pucará and the Arqueological Museum. Then, you will arrive in Humahuaca where a great Cathedral and the Independence Monument (El Indio) stand. After lunch, you will observe the Paleta del Pintor located in the town of Maimara. Finally, you will arrive and visit San Salvador in Jujuy on your way back to Salta. 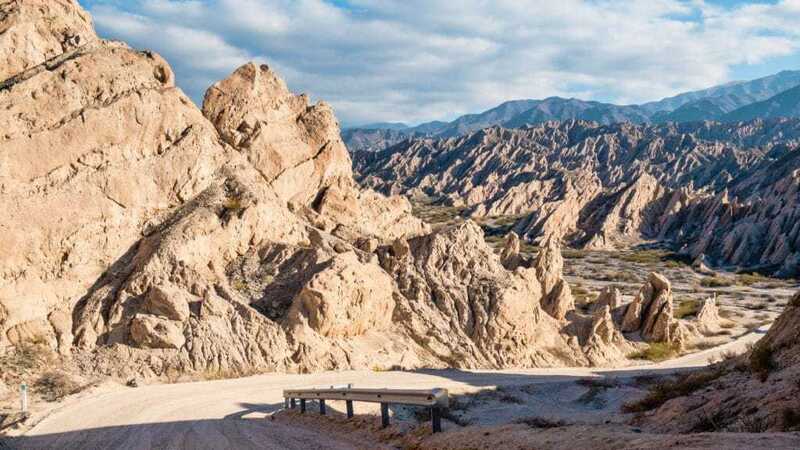 You will finish your tour of Northern Argentina in Salta, and be transferred to the airport.